In September 1862, fighting from the Battle of Antietam spilled into Sharpsburg’s streets. Residents were left to bury the dead from both sides. Today, locals report lingering echoes of that strife, from the faint taps of a Union drummer boy named Charley King, to the phantom footsteps of Confederate soldiers charging up the stairs of the Rohrbach House. 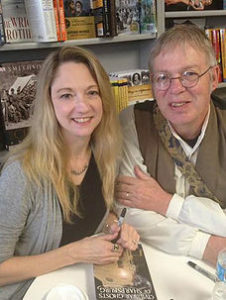 On October 18, come hear tour guides Mark and Julia Brugh craft a vivid portrait of Sharpsburg in the Civil War and bring to light stories of the ghosts for whom the conflict never ended. Mark and Julia are also the authors of Civil War Ghosts of Sharpsburg, which features the story of Jacob Rohrbach. Julia Stinson Brugh is a native of West Virginia and grew up surrounded by Civil War legends. She was exposed at an early age to the rich history of the area, and lived in a haunted house in Harpers Ferry as a small child. Julia’s father was a historian with the National Park service, and growing up included frequent visits to Antietam with her parents and younger sister. Julia has a love of oral history, folklore, and ghost stories, which combined with Mark’s passion for history, makes the Sharpsburg Tour Company special. Mark P. Brugh has studied Civil War history for more than thirty years. 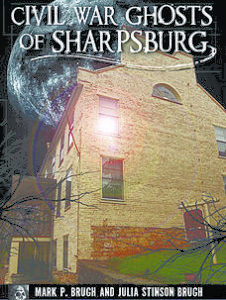 This passion led to the inception of the Sharpsburg Civil War Ghosts Tours, which offer both historical tours of the town, and family friendly ghost tours with a strong historical foundation. He is a member and volunteer for the C&O Canal Association and the Sharpsburg Historical Society. He is also a member of the Hagerstown Civil War Roundtable and the Save Historic Antietam Foundation. Mark has recently start a podcast about the Chronicles of Aaron Good and other fascinating stories of Antietam. Join us on Wednesday, October 18 at 7:00 pm around a campfire in the side yard of the Jacob Rohrbach Inn to hear these intriguing Civil War Ghost stories. This program is free and open to the public. Please bring a chair or blanket to sit around the campfire. Parking is available on Main and Hall Streets. Check our Facebook page for updates. For further information call (301) 432-5079.
your information on your website.